20 CHAPTER Trading with the World. Since ancient times, people have expanded trading as far as technology allowed—Marco Polo’s silk route between Europe and China is an example. 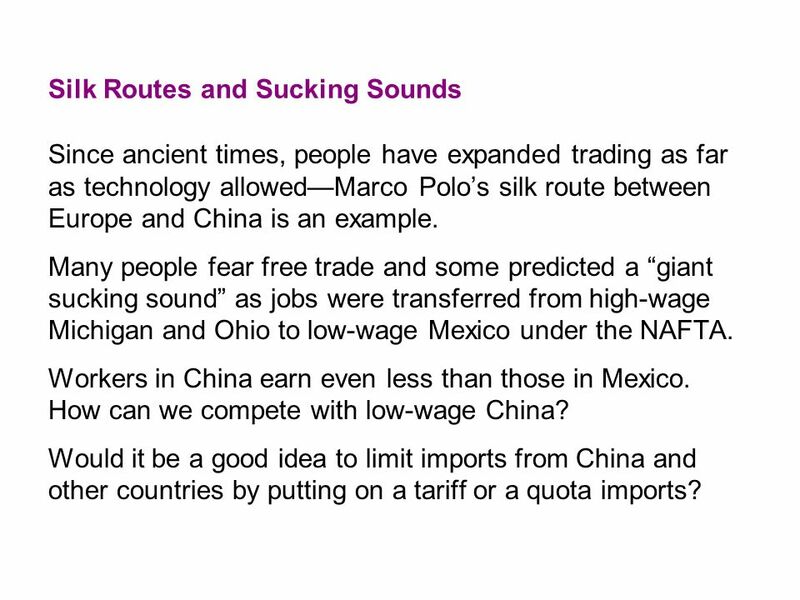 Many people fear free trade and some predicted a “giant sucking sound” as jobs were transferred from high-wage Michigan and Ohio to low-wage Mexico under the NAFTA. Workers in China earn even less than those in Mexico. How can we compete with low-wage China? Would it be a good idea to limit imports from China and other countries by putting on a tariff or a quota imports? Imports are the good and services that we buy from people in other countries. 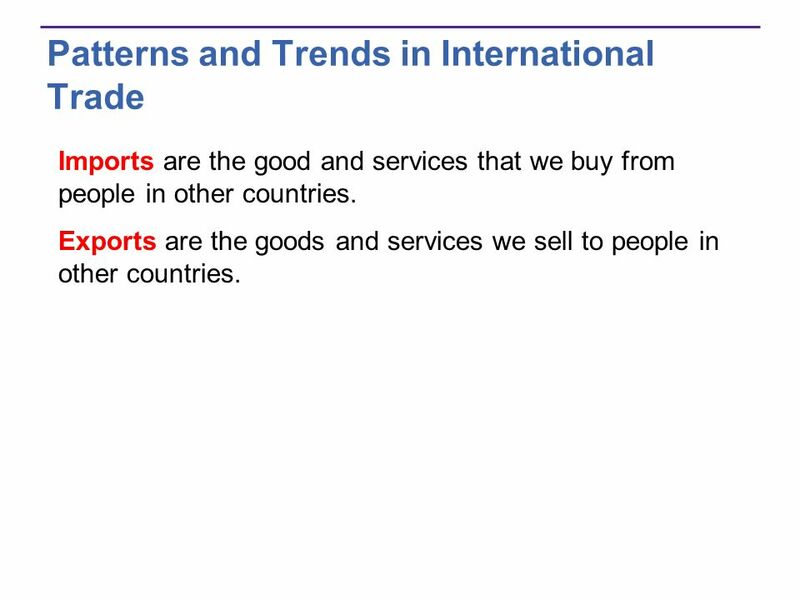 Exports are the goods and services we sell to people in other countries. Trade in Goods Manufactured goods represent 55 percent of U.S. exports and 68 percent of U.S. imports. Raw materials and semi-manufactured materials represent 14 percent of U.S. exports and 15 percent of U.S. imports. Agricultural products account for only 8 percent of U.S. exports and 4 percent of U.S. imports. 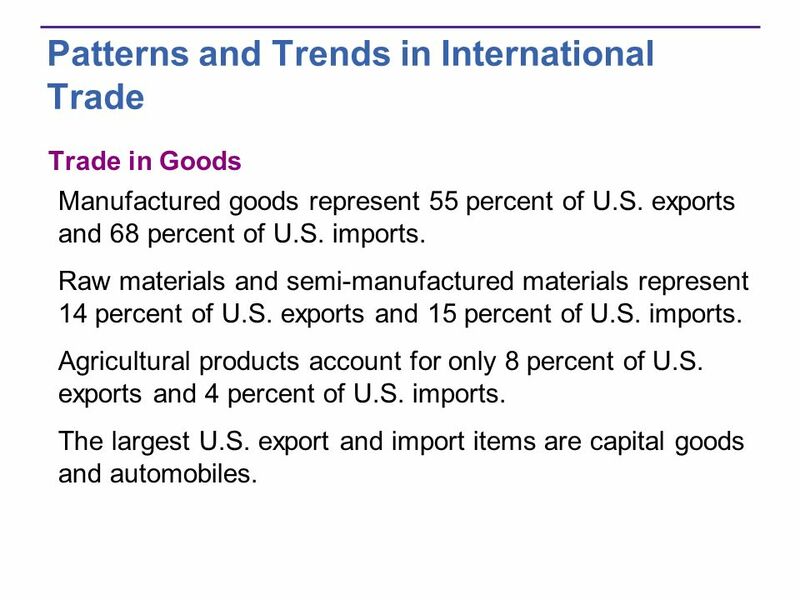 The largest U.S. export and import items are capital goods and automobiles. Trade in Services International trade in services such as travel, transportation, and insurance is large and growing. 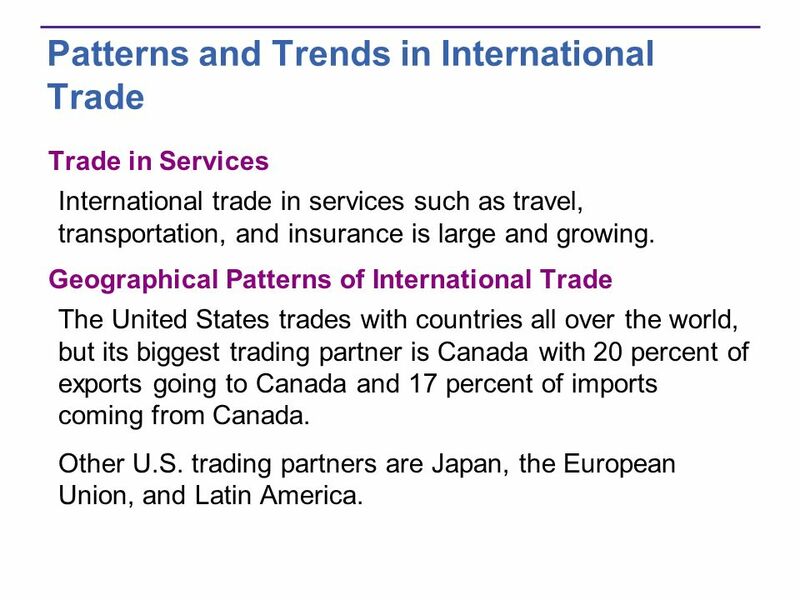 Geographical Patterns of International Trade The United States trades with countries all over the world, but its biggest trading partner is Canada with 20 percent of exports going to Canada and 17 percent of imports coming from Canada. Other U.S. trading partners are Japan, the European Union, and Latin America. 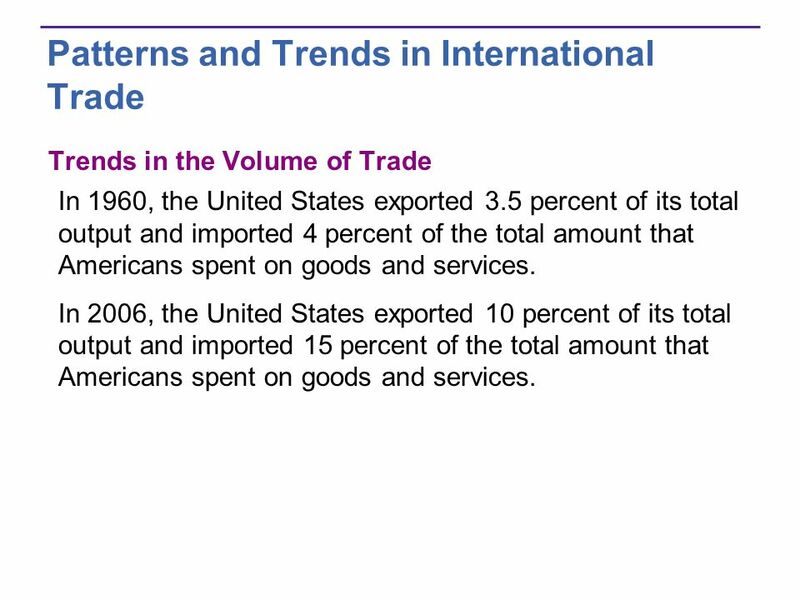 Trends in the Volume of Trade In 1960, the United States exported 3.5 percent of its total output and imported 4 percent of the total amount that Americans spent on goods and services. In 2006, the United States exported 10 percent of its total output and imported 15 percent of the total amount that Americans spent on goods and services. 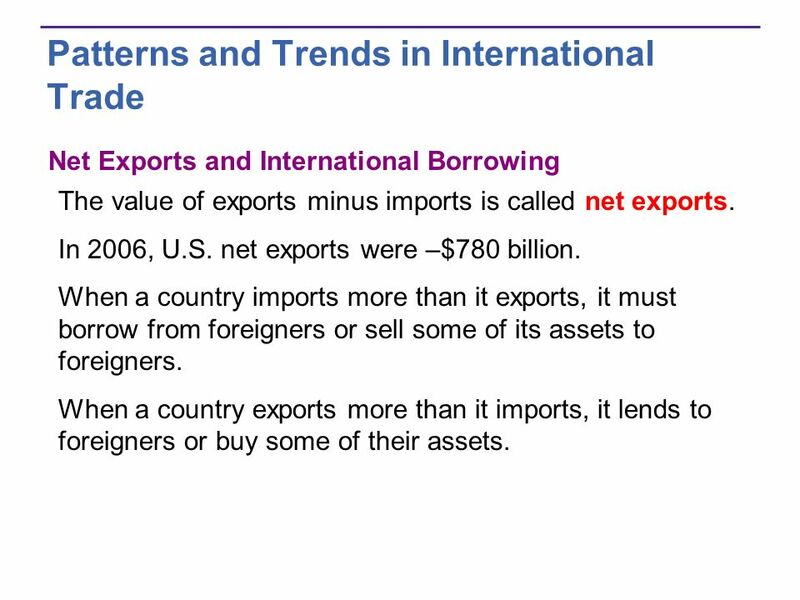 Net Exports and International Borrowing The value of exports minus imports is called net exports. In 2006, U.S. net exports were –$780 billion. When a country imports more than it exports, it must borrow from foreigners or sell some of its assets to foreigners. When a country exports more than it imports, it lends to foreigners or buy some of their assets. 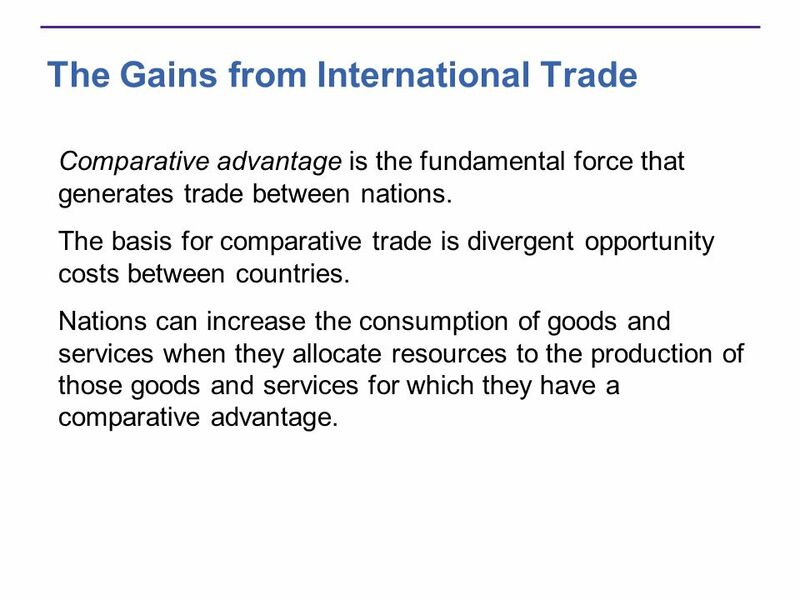 Comparative advantage is the fundamental force that generates trade between nations. 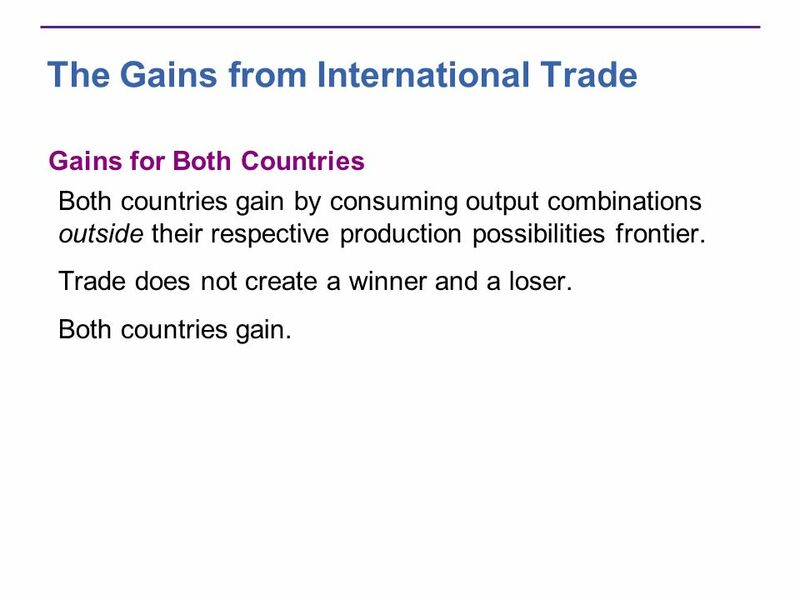 The basis for comparative trade is divergent opportunity costs between countries. Nations can increase the consumption of goods and services when they allocate resources to the production of those goods and services for which they have a comparative advantage. 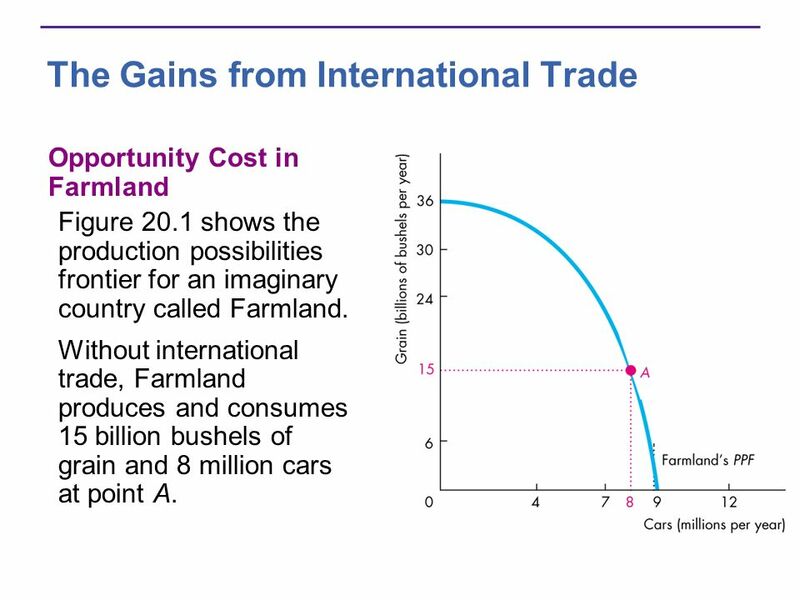 Opportunity Cost in Farmland Figure 20.1 shows the production possibilities frontier for an imaginary country called Farmland. Without international trade, Farmland produces and consumes 15 billion bushels of grain and 8 million cars at point A. 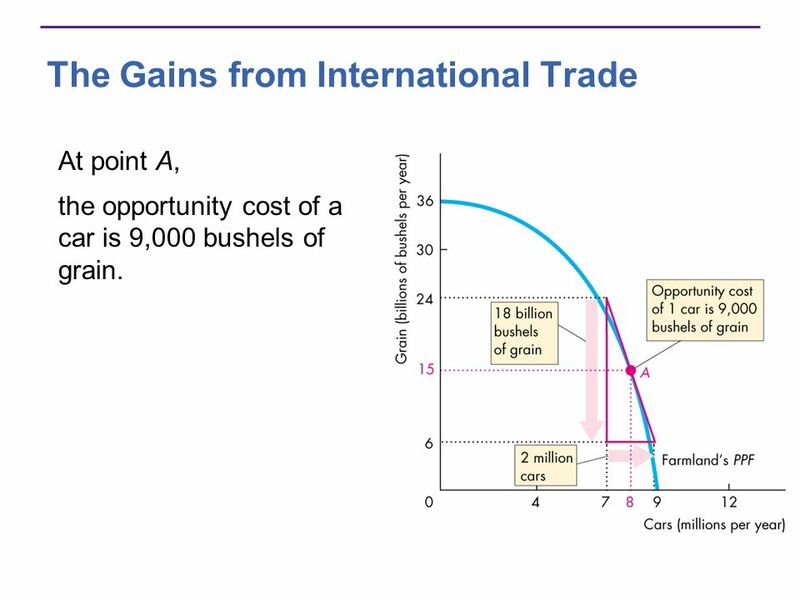 At point A, the opportunity cost of a car is 9,000 bushels of grain. Opportunity Cost in Mobilia Figure 20.2 shows the production possibilities frontier for another imaginary country called Mobilia. 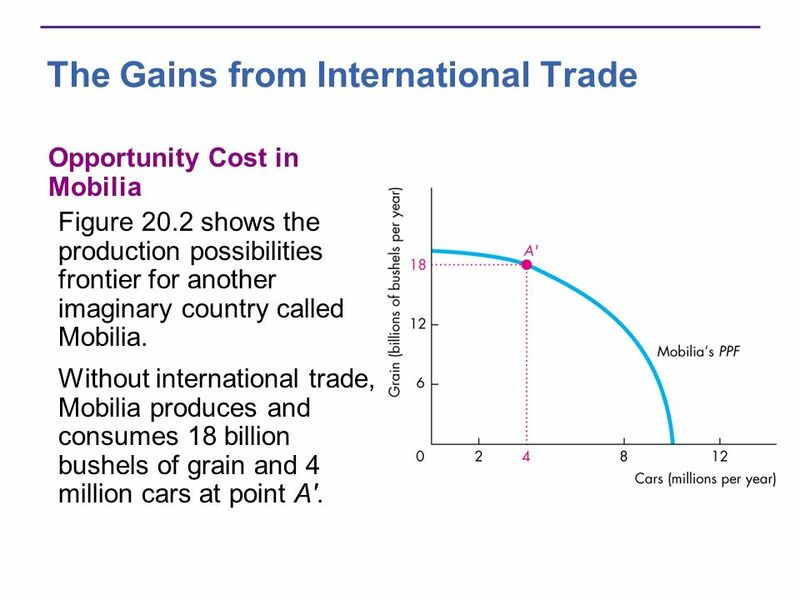 Without international trade, Mobilia produces and consumes 18 billion bushels of grain and 4 million cars at point A'. 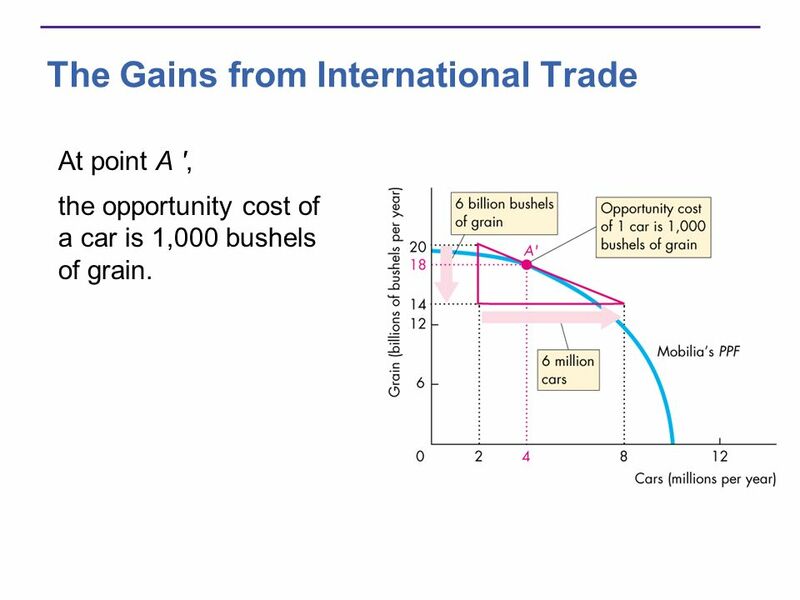 At point A ', the opportunity cost of a car is 1,000 bushels of grain. 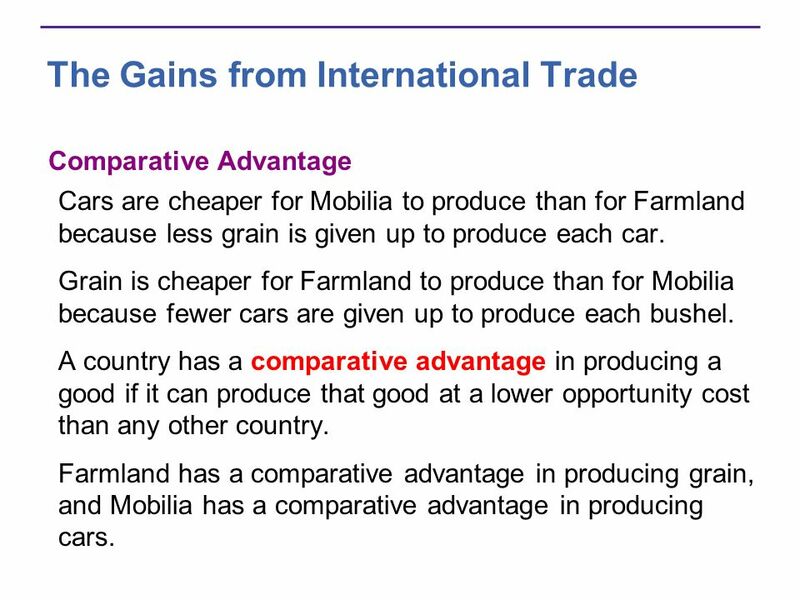 Comparative Advantage Cars are cheaper for Mobilia to produce than for Farmland because less grain is given up to produce each car. Grain is cheaper for Farmland to produce than for Mobilia because fewer cars are given up to produce each bushel. A country has a comparative advantage in producing a good if it can produce that good at a lower opportunity cost than any other country. Farmland has a comparative advantage in producing grain, and Mobilia has a comparative advantage in producing cars. 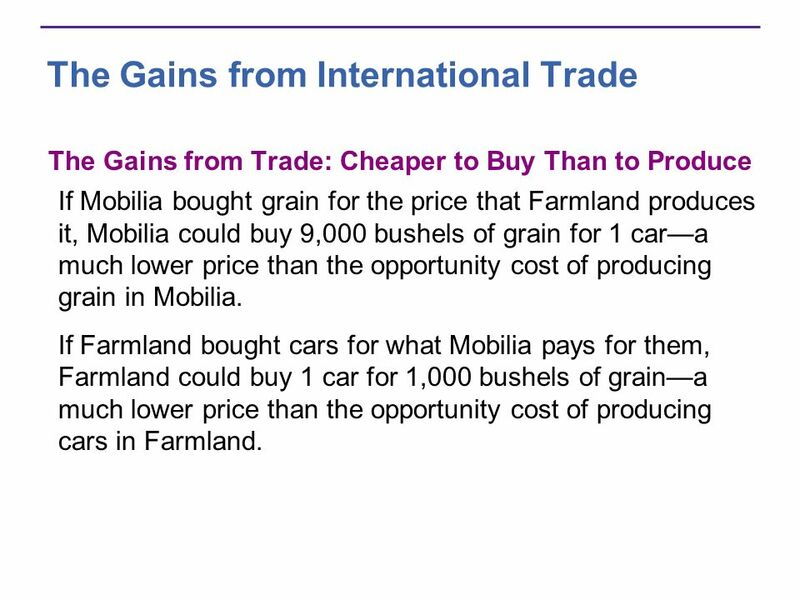 The Gains from Trade: Cheaper to Buy Than to Produce If Mobilia bought grain for the price that Farmland produces it, Mobilia could buy 9,000 bushels of grain for 1 car—a much lower price than the opportunity cost of producing grain in Mobilia. If Farmland bought cars for what Mobilia pays for them, Farmland could buy 1 car for 1,000 bushels of grain—a much lower price than the opportunity cost of producing cars in Farmland. The Terms of Trade The quantity of grain that Farmland must pay Mobilia for a car is called Farmland’s terms of trade with Mobilia. 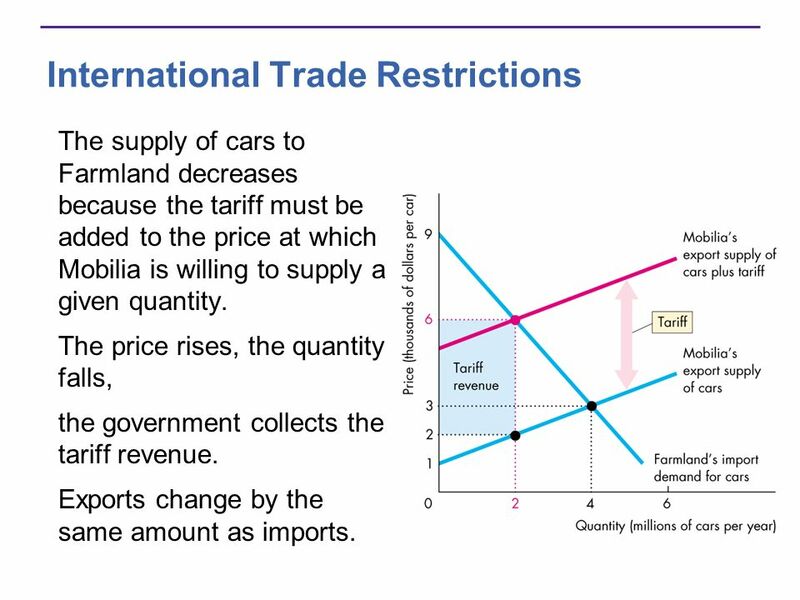 Figure 20.3 shows how the forces of international demand and supply determine the terms of trade and the volume of trade. With no international trade, Mobilia can produce a car for 1,000 bushels of grain, so at that price, it plans to sell no cars to Farmland. But as the price rises above 1,000 bushels of grain per car the quantity of cars supplied by Mobilia increases. 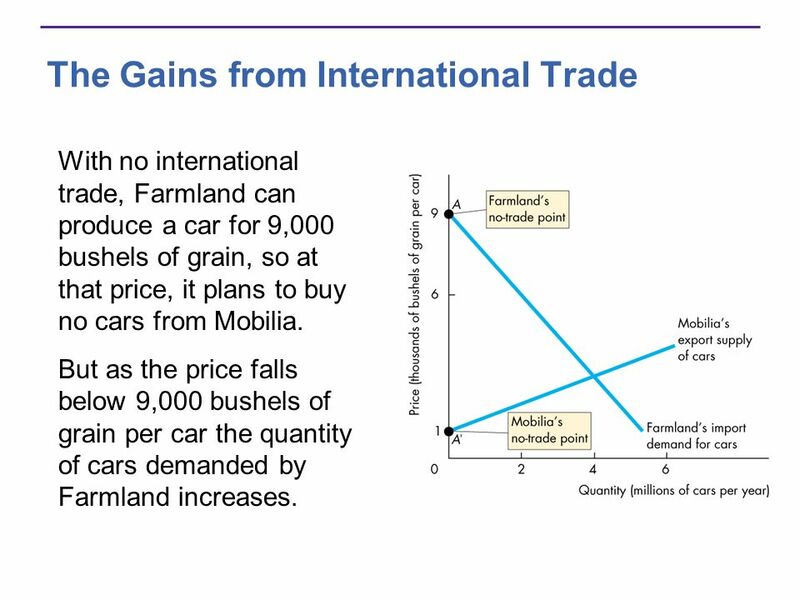 With no international trade, Farmland can produce a car for 9,000 bushels of grain, so at that price, it plans to buy no cars from Mobilia. But as the price falls below 9,000 bushels of grain per car the quantity of cars demanded by Farmland increases. 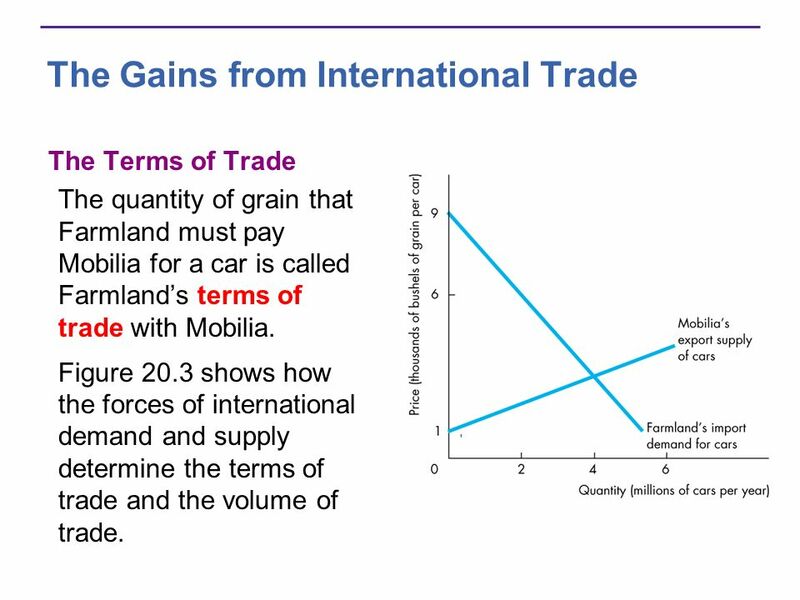 The equilibrium terms of trade (price) is 3,000 bushels of grain per car and 4 million cars are exported by Mobilia and imported by Farmland. 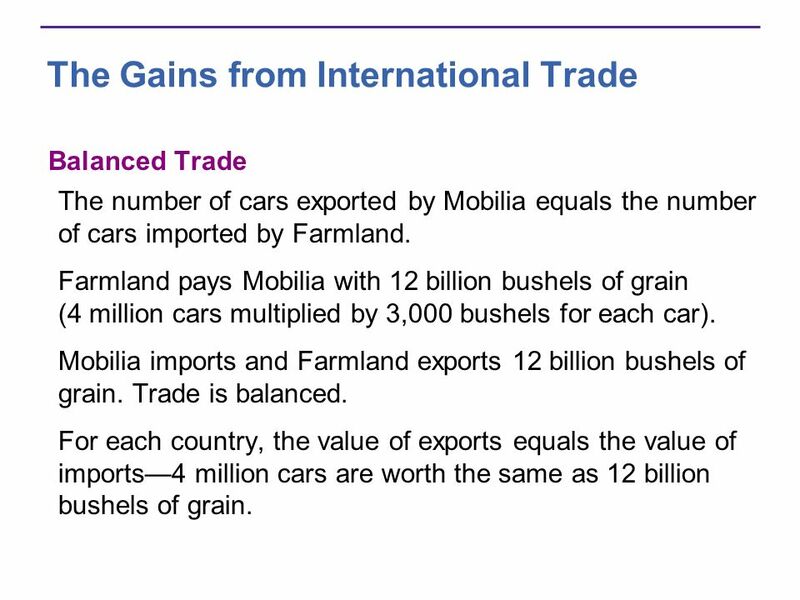 Balanced Trade The number of cars exported by Mobilia equals the number of cars imported by Farmland. Farmland pays Mobilia with 12 billion bushels of grain (4 million cars multiplied by 3,000 bushels for each car). Mobilia imports and Farmland exports 12 billion bushels of grain. Trade is balanced. For each country, the value of exports equals the value of imports—4 million cars are worth the same as 12 billion bushels of grain. 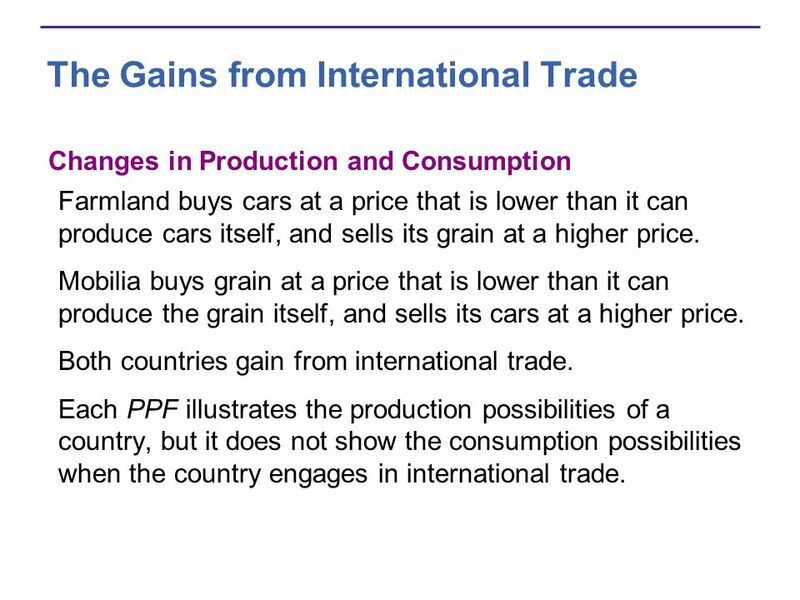 Changes in Production and Consumption Farmland buys cars at a price that is lower than it can produce cars itself, and sells its grain at a higher price. 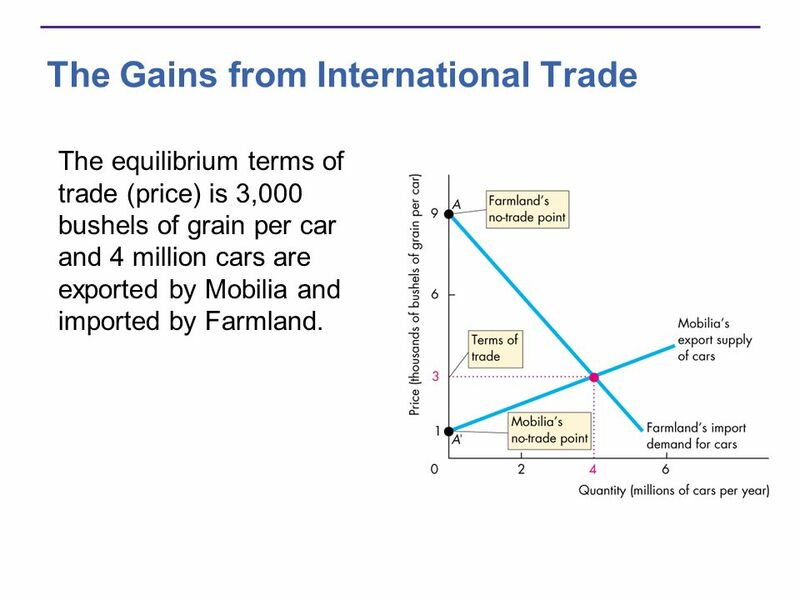 Mobilia buys grain at a price that is lower than it can produce the grain itself, and sells its cars at a higher price. Both countries gain from international trade. Each PPF illustrates the production possibilities of a country, but it does not show the consumption possibilities when the country engages in international trade. 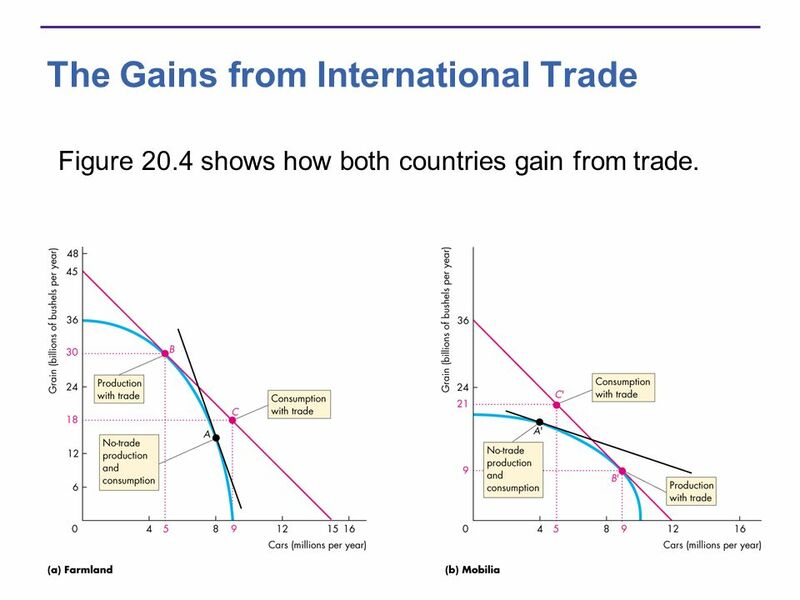 Figure 20.4 shows how both countries gain from trade. 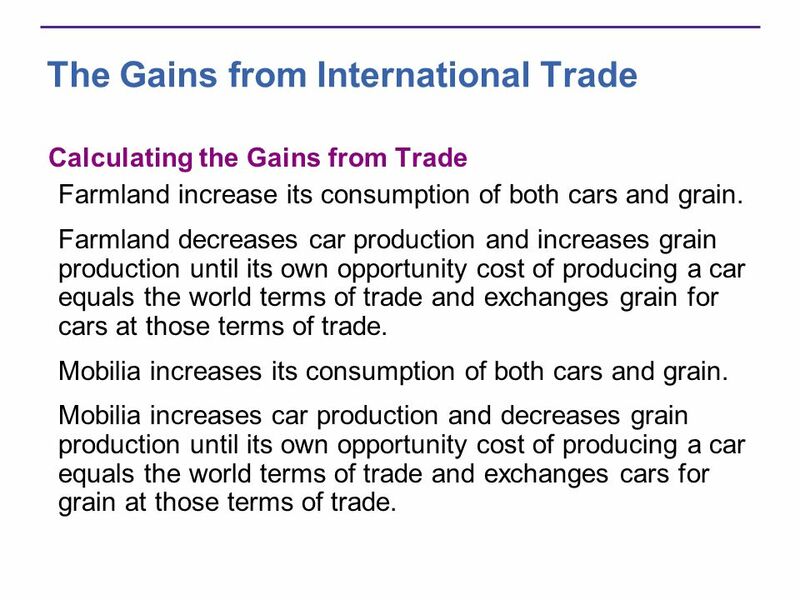 Calculating the Gains from Trade Farmland increase its consumption of both cars and grain. Farmland decreases car production and increases grain production until its own opportunity cost of producing a car equals the world terms of trade and exchanges grain for cars at those terms of trade. Mobilia increases its consumption of both cars and grain. 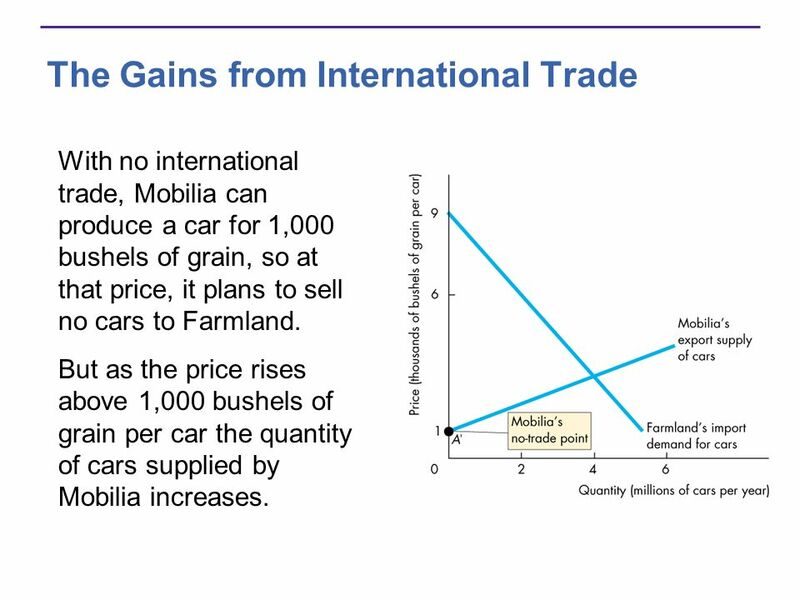 Mobilia increases car production and decreases grain production until its own opportunity cost of producing a car equals the world terms of trade and exchanges cars for grain at those terms of trade. Gains for Both Countries Both countries gain by consuming output combinations outside their respective production possibilities frontier. Trade does not create a winner and a loser. Both countries gain. 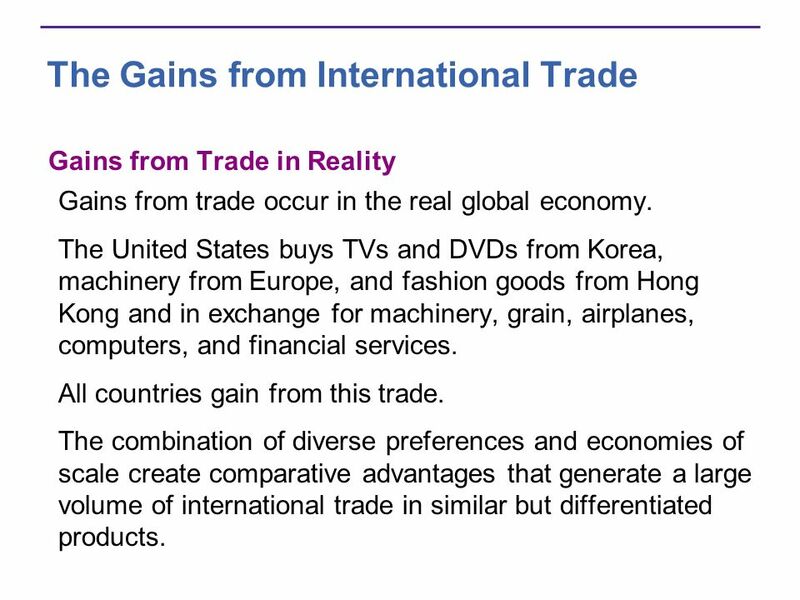 Gains from Trade in Reality Gains from trade occur in the real global economy. The United States buys TVs and DVDs from Korea, machinery from Europe, and fashion goods from Hong Kong and in exchange for machinery, grain, airplanes, computers, and financial services. All countries gain from this trade. The combination of diverse preferences and economies of scale create comparative advantages that generate a large volume of international trade in similar but differentiated products. Governments restrict international trade to protect domestic producers from competition by using two main tools: 1. Tariffs 2. Nontariff barriers A tariff is a tax that is imposed by the importing country when an imported good crosses its international boundary. 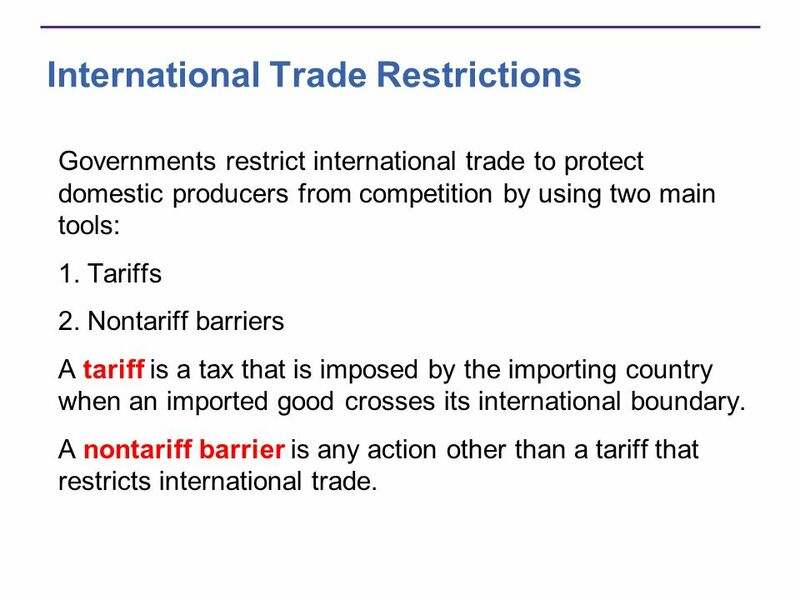 A nontariff barrier is any action other than a tariff that restricts international trade. The History of U.S. Tariffs Figure 20.5 shows the U.S. average tariff rate since 1930. 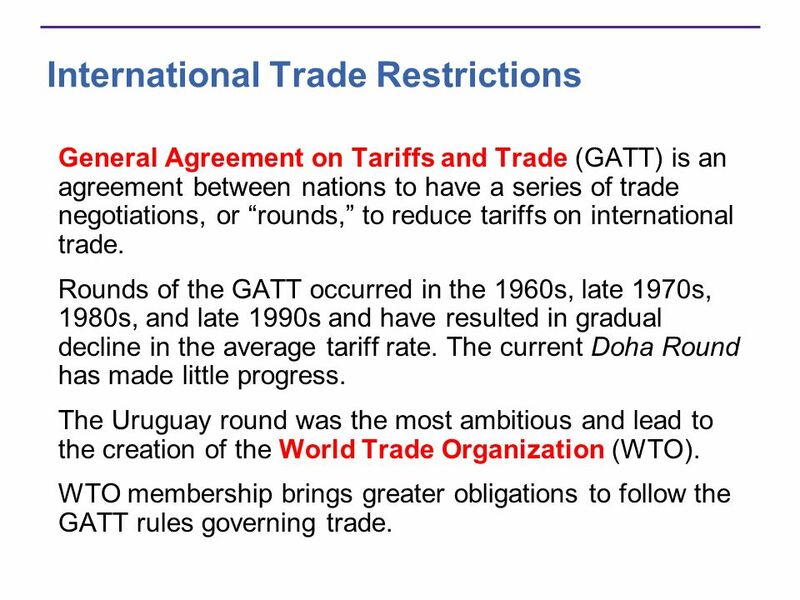 General Agreement on Tariffs and Trade (GATT) is an agreement between nations to have a series of trade negotiations, or “rounds,” to reduce tariffs on international trade. 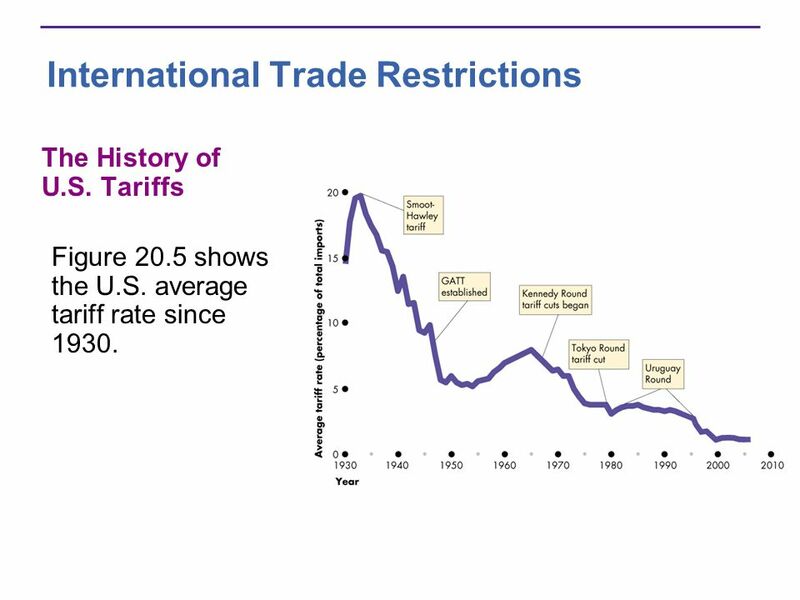 Rounds of the GATT occurred in the 1960s, late 1970s, 1980s, and late 1990s and have resulted in gradual decline in the average tariff rate. The current Doha Round has made little progress. The Uruguay round was the most ambitious and lead to the creation of the World Trade Organization (WTO). WTO membership brings greater obligations to follow the GATT rules governing trade. 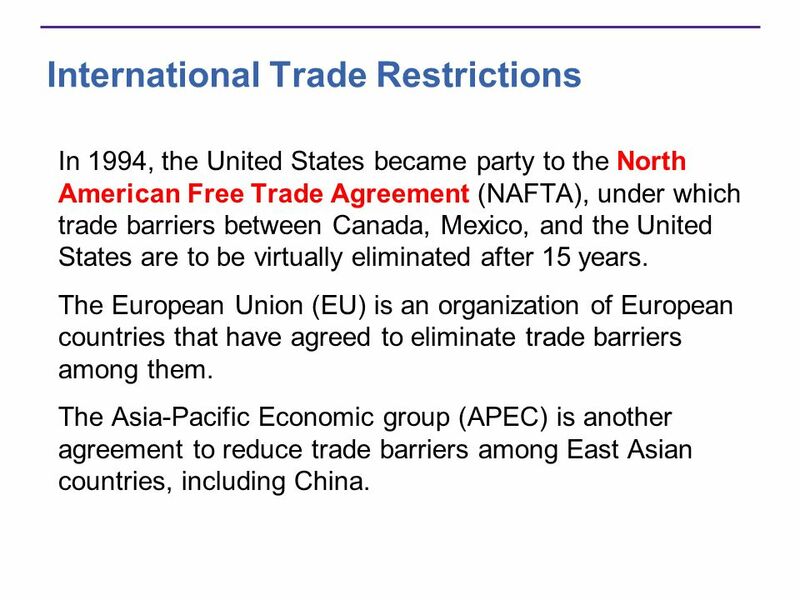 In 1994, the United States became party to the North American Free Trade Agreement (NAFTA), under which trade barriers between Canada, Mexico, and the United States are to be virtually eliminated after 15 years. The European Union (EU) is an organization of European countries that have agreed to eliminate trade barriers among them. The Asia-Pacific Economic group (APEC) is another agreement to reduce trade barriers among East Asian countries, including China. How Tariffs Work Tariffs increase the price that consumers of the importing country must pay for imported goods or services. 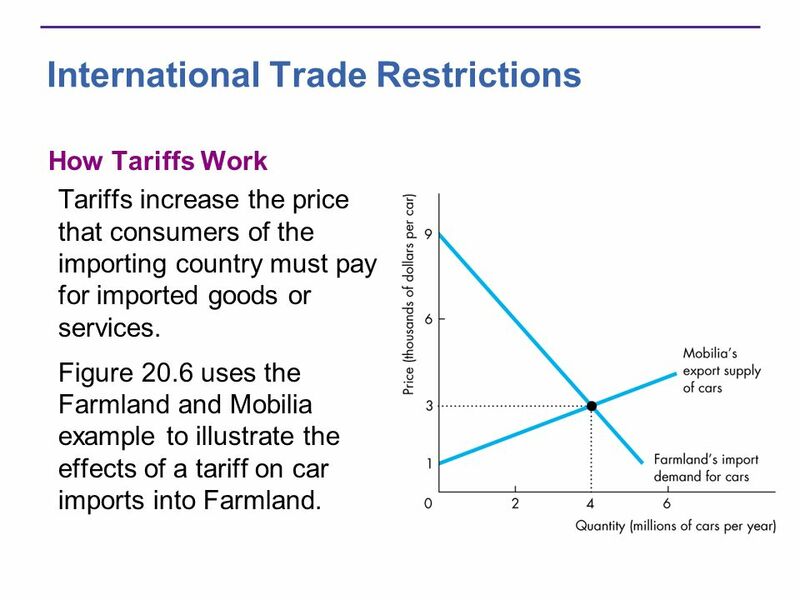 Figure 20.6 uses the Farmland and Mobilia example to illustrate the effects of a tariff on car imports into Farmland. The supply of cars to Farmland decreases because the tariff must be added to the price at which Mobilia is willing to supply a given quantity. The price rises, the quantity falls, the government collects the tariff revenue. Exports change by the same amount as imports. 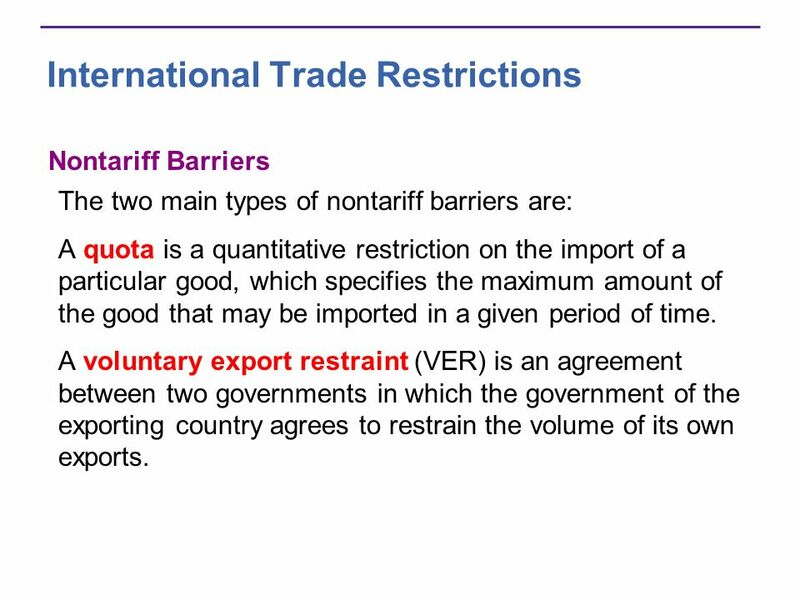 Nontariff Barriers The two main types of nontariff barriers are: A quota is a quantitative restriction on the import of a particular good, which specifies the maximum amount of the good that may be imported in a given period of time. A voluntary export restraint (VER) is an agreement between two governments in which the government of the exporting country agrees to restrain the volume of its own exports. 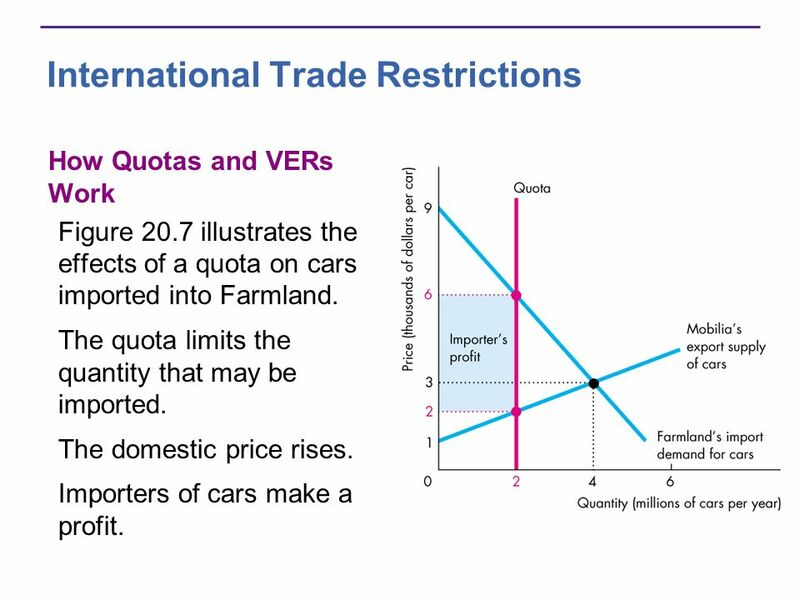 How Quotas and VERs Work Figure 20.7 illustrates the effects of a quota on cars imported into Farmland. The quota limits the quantity that may be imported. The domestic price rises. Importers of cars make a profit. 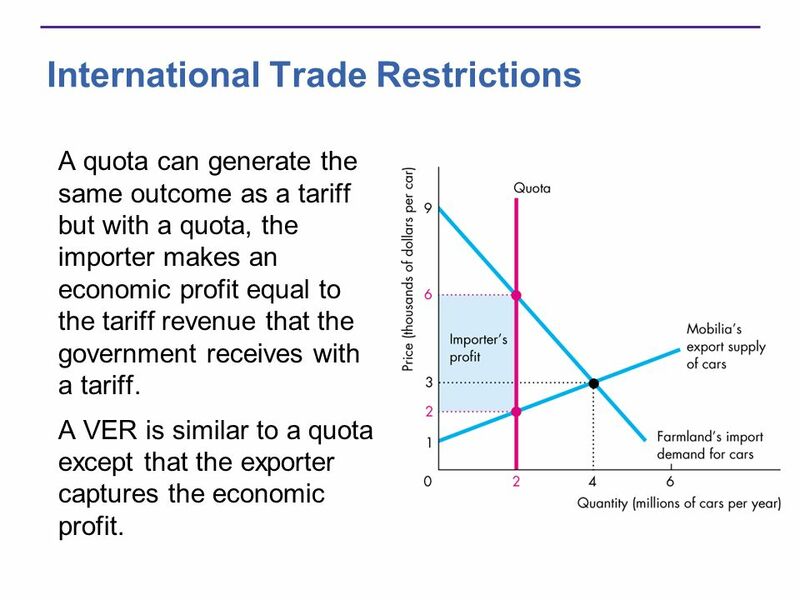 A quota can generate the same outcome as a tariff but with a quota, the importer makes an economic profit equal to the tariff revenue that the government receives with a tariff. A VER is similar to a quota except that the exporter captures the economic profit. Despite the fact that free trade promotes prosperity for all countries, trade is restricted. 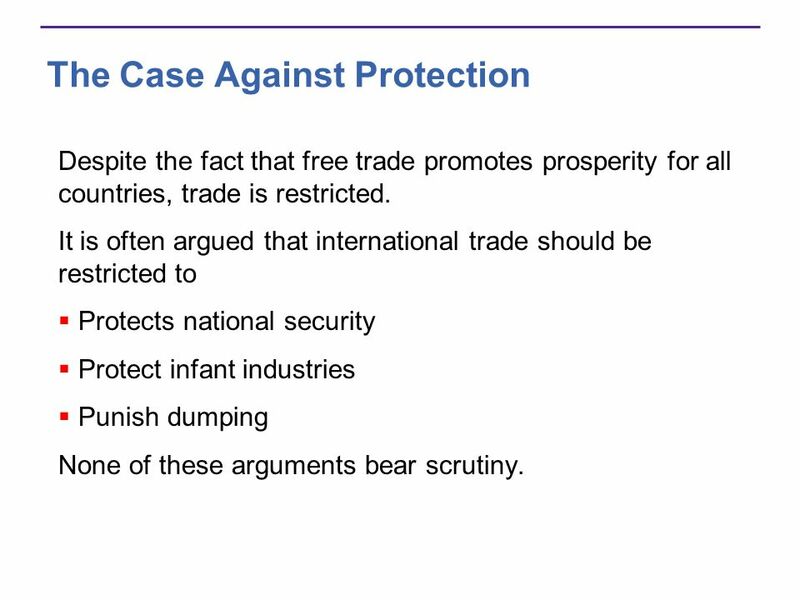 It is often argued that international trade should be restricted to Protects national security Protect infant industries Punish dumping None of these arguments bear scrutiny. 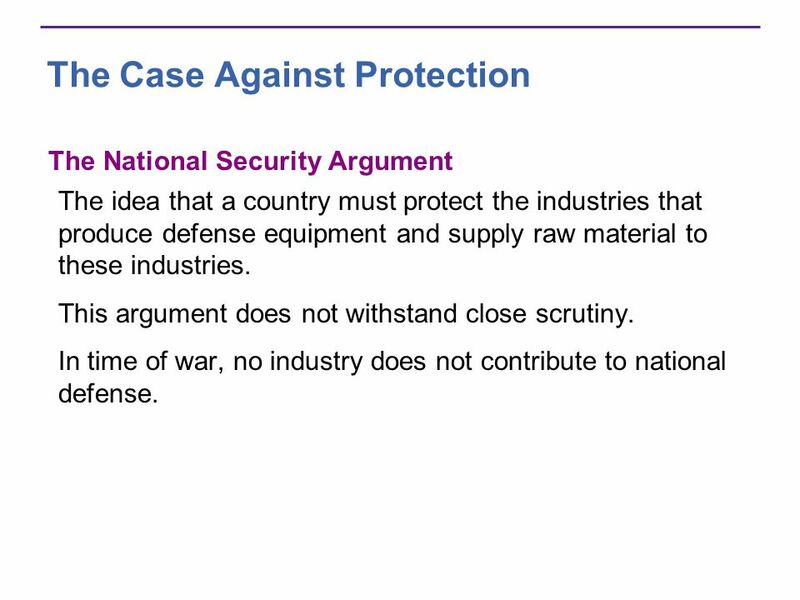 The National Security Argument The idea that a country must protect the industries that produce defense equipment and supply raw material to these industries. This argument does not withstand close scrutiny. In time of war, no industry does not contribute to national defense. 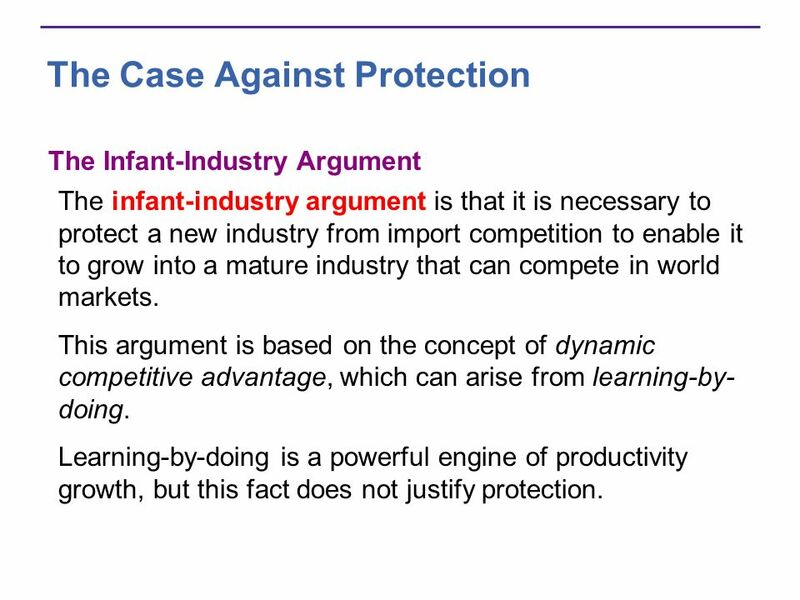 The Infant-Industry Argument The infant-industry argument is that it is necessary to protect a new industry from import competition to enable it to grow into a mature industry that can compete in world markets. This argument is based on the concept of dynamic competitive advantage, which can arise from learning-by-doing. Learning-by-doing is a powerful engine of productivity growth, but this fact does not justify protection. The Dumping Argument Dumping occurs when foreign a firm sells its exports at a lower price than its cost of production. Dumping is seen as a justification for a tariff to prevent a foreign firm driving domestic firms out of business and then raising its price. 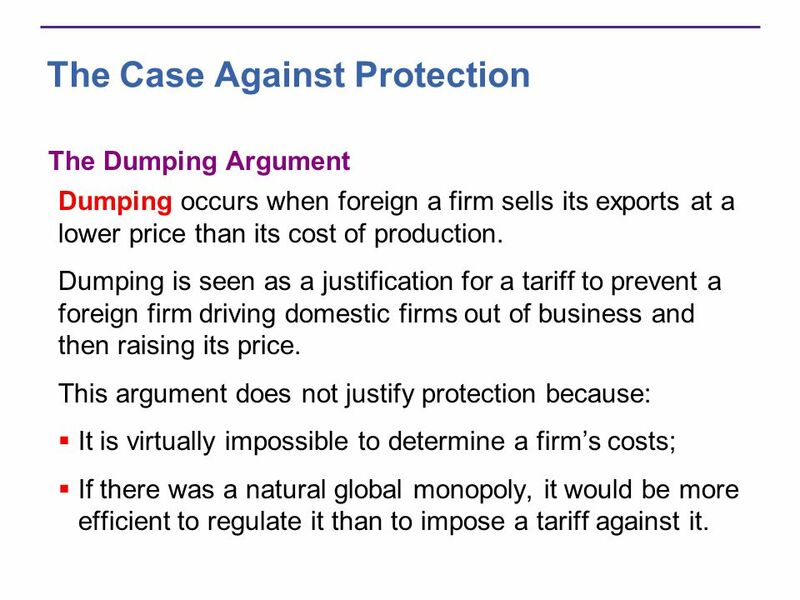 This argument does not justify protection because: It is virtually impossible to determine a firm’s costs; If there was a natural global monopoly, it would be more efficient to regulate it than to impose a tariff against it. 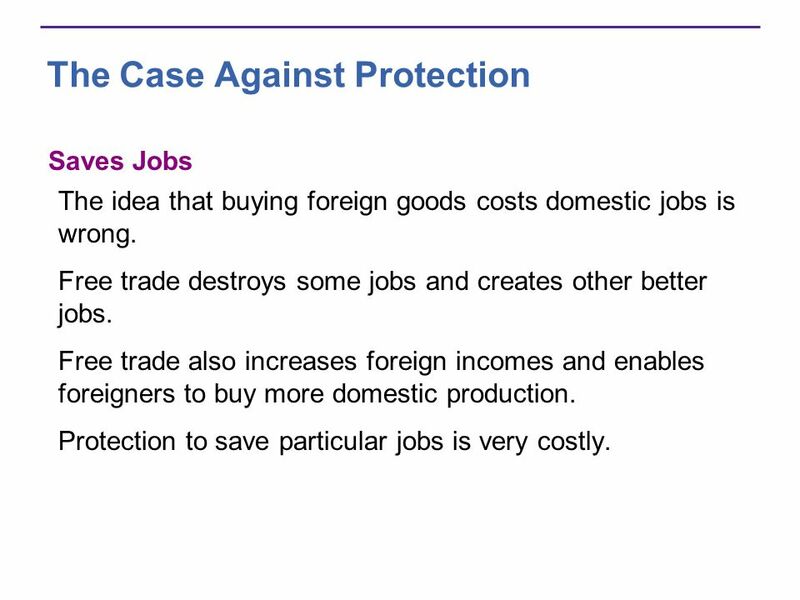 Saves Jobs The idea that buying foreign goods costs domestic jobs is wrong. Free trade destroys some jobs and creates other better jobs. Free trade also increases foreign incomes and enables foreigners to buy more domestic production. Protection to save particular jobs is very costly. 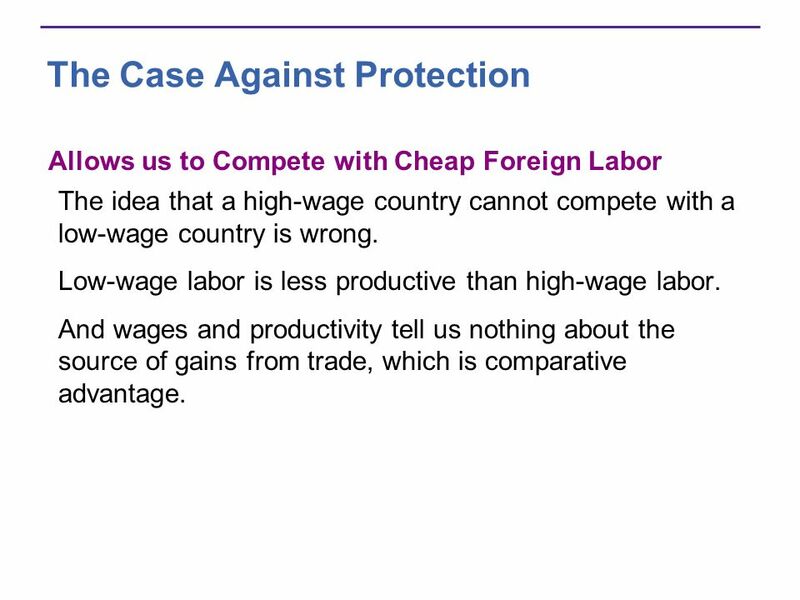 Allows us to Compete with Cheap Foreign Labor The idea that a high-wage country cannot compete with a low-wage country is wrong. Low-wage labor is less productive than high-wage labor. And wages and productivity tell us nothing about the source of gains from trade, which is comparative advantage. 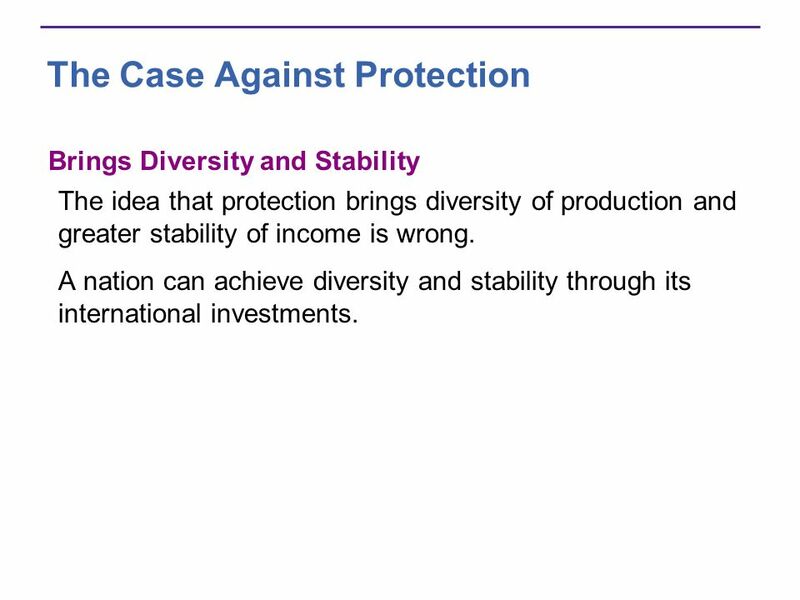 Brings Diversity and Stability The idea that protection brings diversity of production and greater stability of income is wrong. A nation can achieve diversity and stability through its international investments. 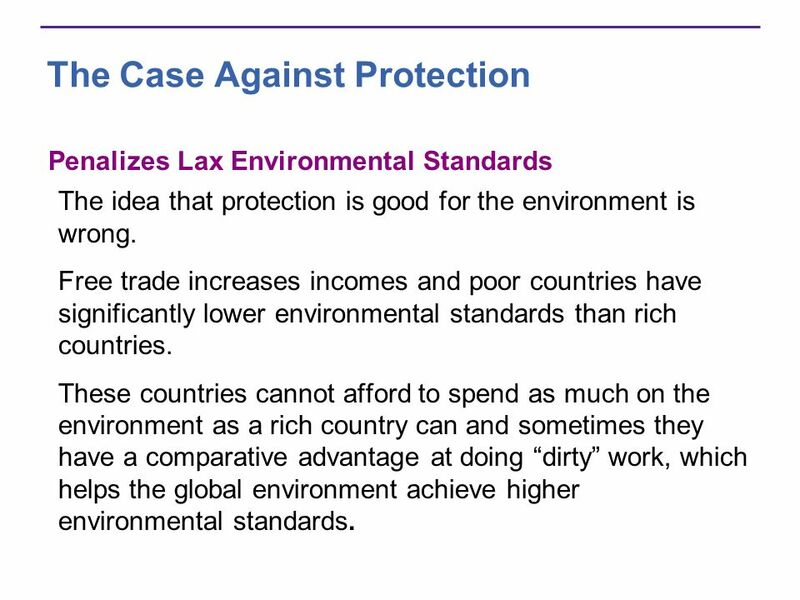 Penalizes Lax Environmental Standards The idea that protection is good for the environment is wrong. Free trade increases incomes and poor countries have significantly lower environmental standards than rich countries. These countries cannot afford to spend as much on the environment as a rich country can and sometimes they have a comparative advantage at doing “dirty” work, which helps the global environment achieve higher environmental standards. Protects National Culture The idea that trade restrictions protect the national culture is wrong. This argument is heard in Canada and European countries. Many countries are afraid of the “Americanization” of their culture through the prominence of American films, television programs, art, literature, and even cuisine in world markets. Protecting “cultural” industries is a form of rent seeking and the surest way to eliminate a national culture. 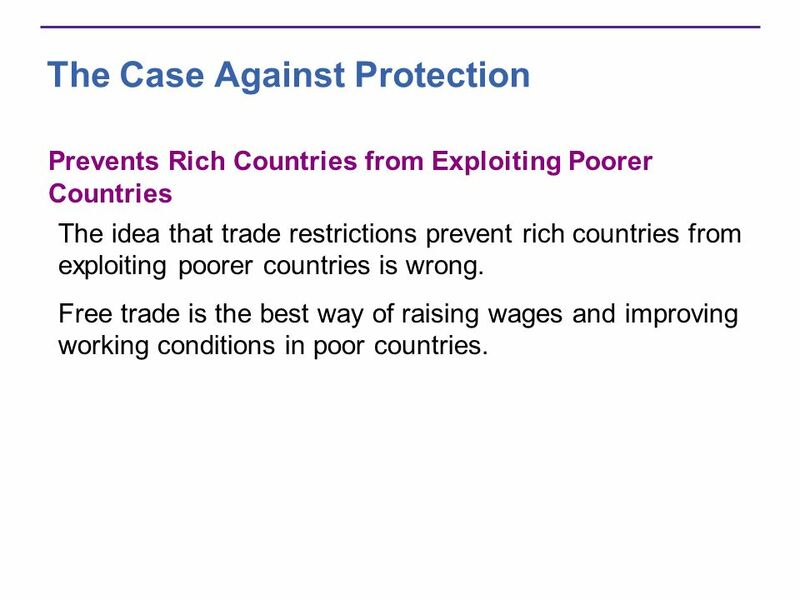 Prevents Rich Countries from Exploiting Poorer Countries The idea that trade restrictions prevent rich countries from exploiting poorer countries is wrong. Free trade is the best way of raising wages and improving working conditions in poor countries. The most compelling argument against protection is that it invites retaliation. 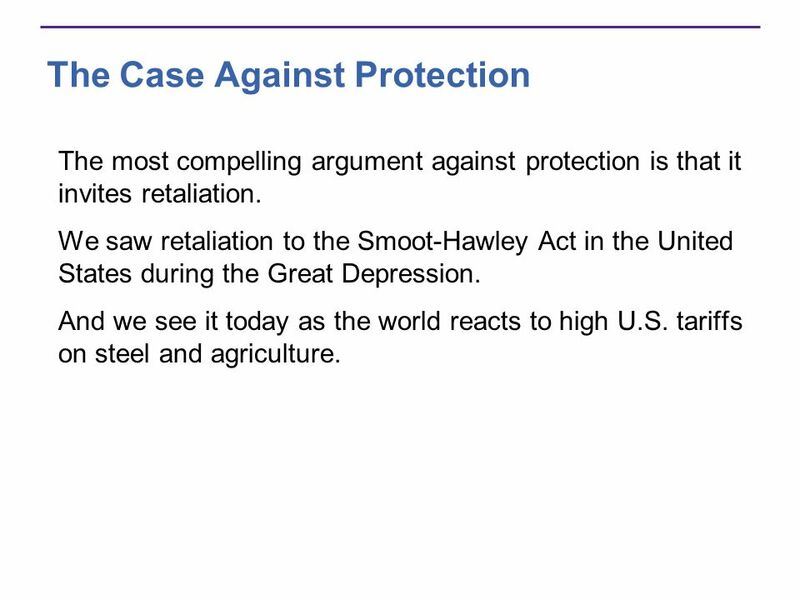 We saw retaliation to the Smoot-Hawley Act in the United States during the Great Depression. And we see it today as the world reacts to high U.S. tariffs on steel and agriculture. 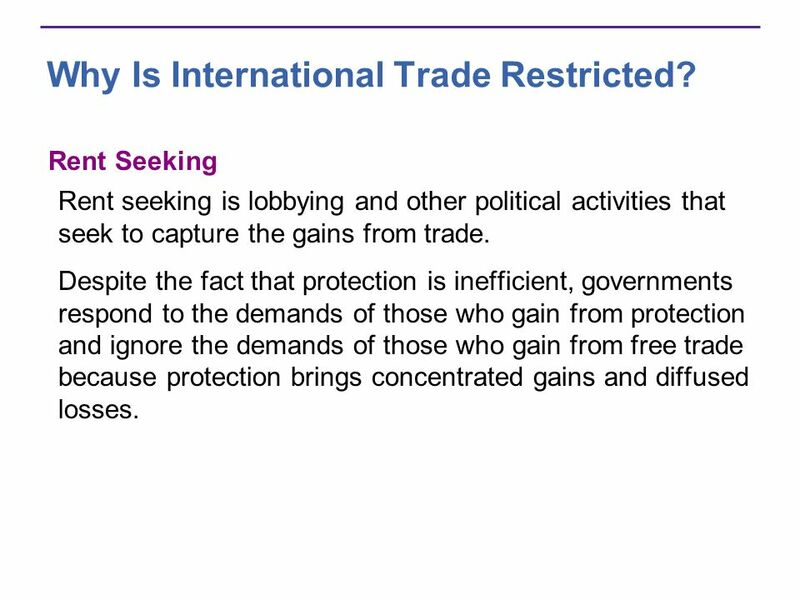 47 Why Is International Trade Restricted? 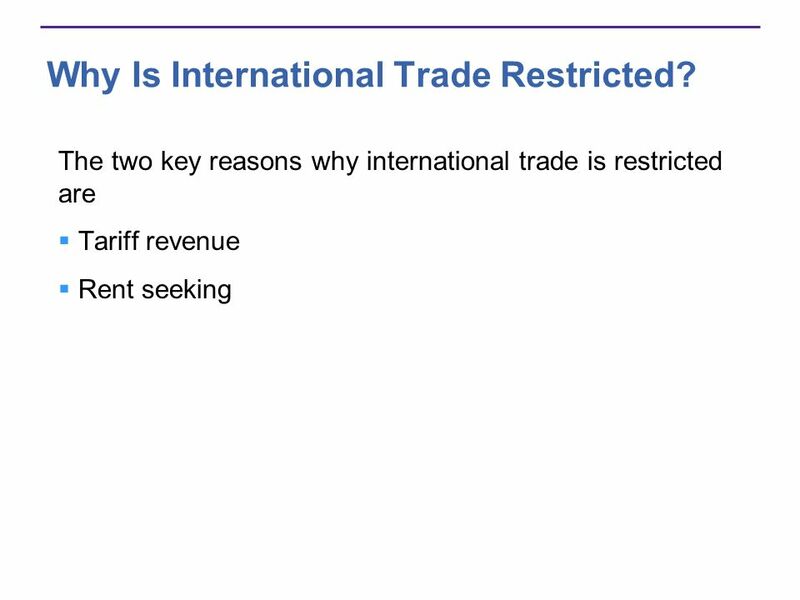 48 Why Is International Trade Restricted? Tariff Revenue It is costly for governments to collect taxes on income and domestic sales. It is cheaper for governments to collect taxes on international transactions because international trade is carefully monitored. This source of revenue is especially attractive to governments in developing nations. 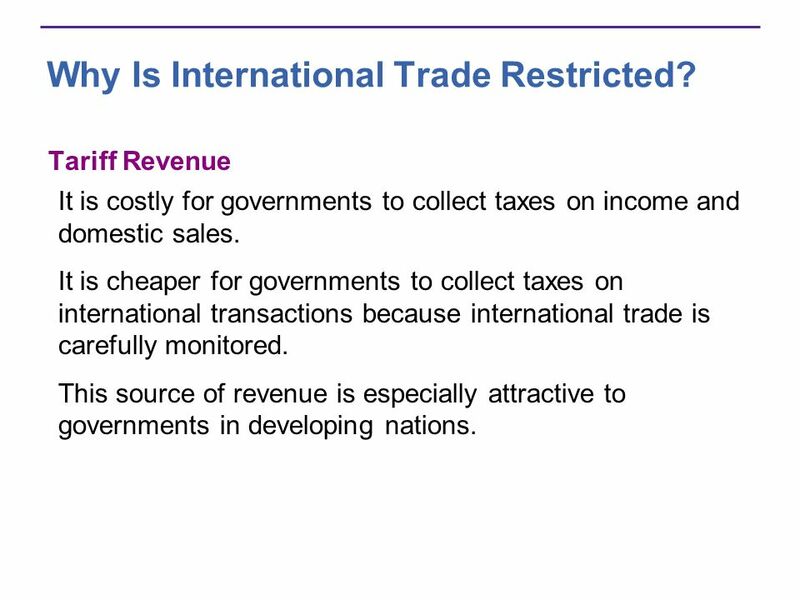 49 Why Is International Trade Restricted? Rent Seeking Rent seeking is lobbying and other political activities that seek to capture the gains from trade. 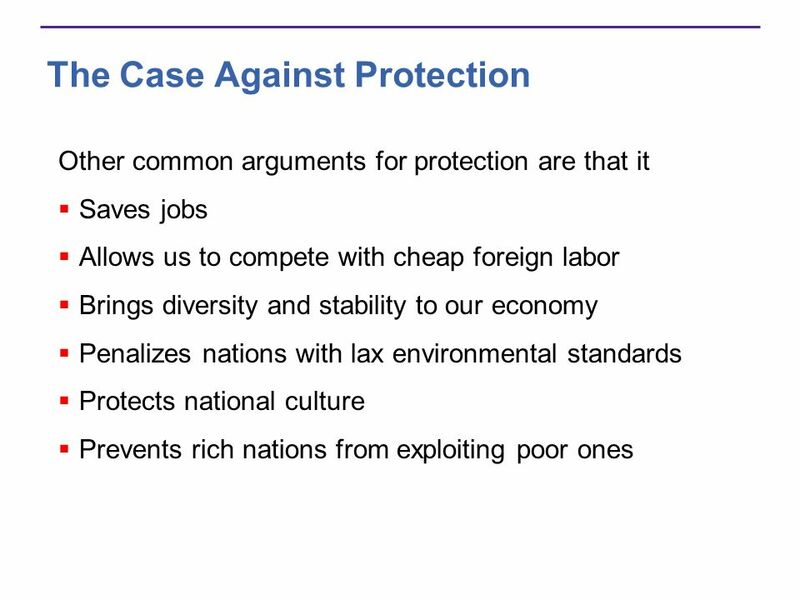 Despite the fact that protection is inefficient, governments respond to the demands of those who gain from protection and ignore the demands of those who gain from free trade because protection brings concentrated gains and diffused losses. 50 Why Is International Trade Restricted? Compensating Losers The gains from free trade exceed the losses, and sometimes free trade agreements address the issue of the distribution of gains from trade by compensating those who lose from free trade. 1. The cost of identifying the losers form free trade and compensating them would be enormous. 2. Difficult to know if the person is a loser from free trade or some other reason. 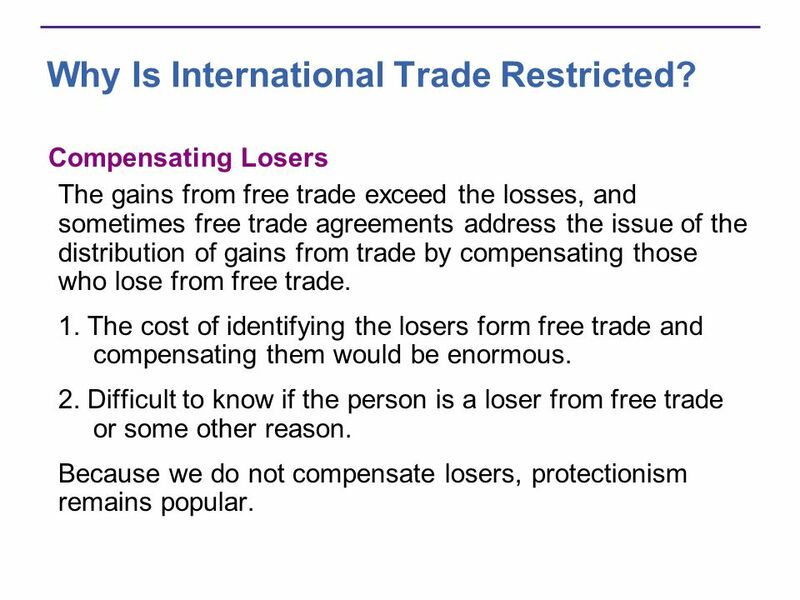 Because we do not compensate losers, protectionism remains popular. 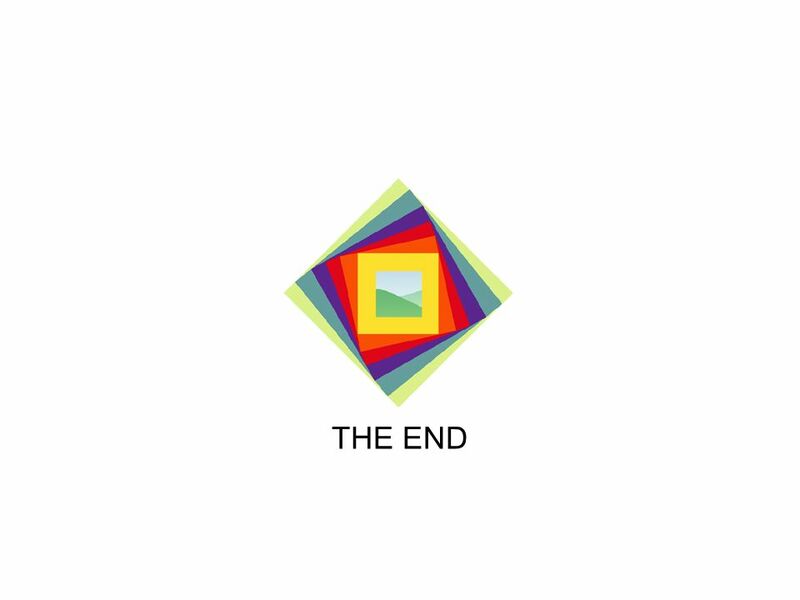 Download ppt "20 CHAPTER Trading with the World." How Global Markets Work Because we trade with people in other countries, the goods and services that we can buy and consume are not limited by what. 18 International Trade CHAPTER. 18 International Trade CHAPTER. 18 International Trade Policy CHECKPOINTS International Trade Policy CHECKPOINTS 2. COPYRIGHT © 2008 Thomson South-Western, a part of The Thomson Corporation. Thomson, the Star logo, and South-Western are trademarks used herein under license. Chapter 6 The Theory of Tariffs and Quotas. CHAPTER 7 Global Markets in Action. 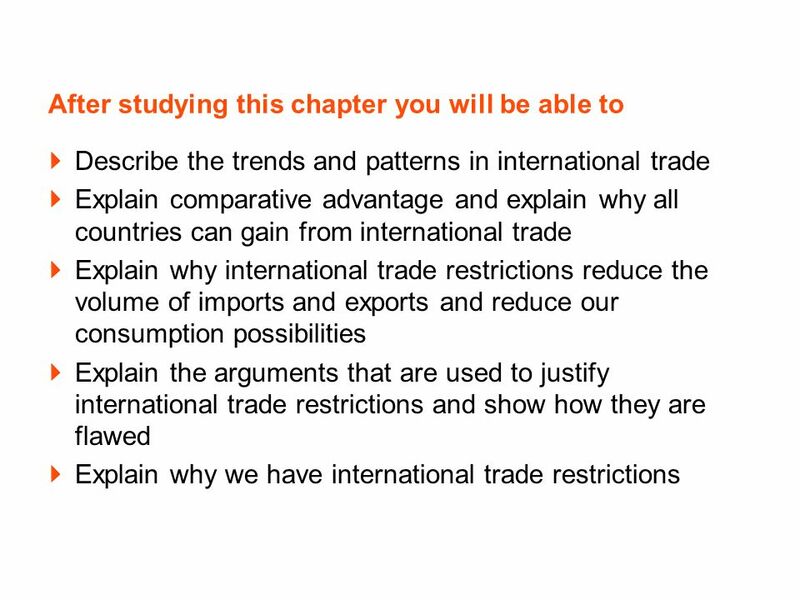 Learning Objectives Explain how markets work with international trade Identify the gains from international trade. © 2010 Pearson Education Canada. iPods, Wii games, and Roots sweaters are just three of the items you might buy that are not produced in Canada. In. 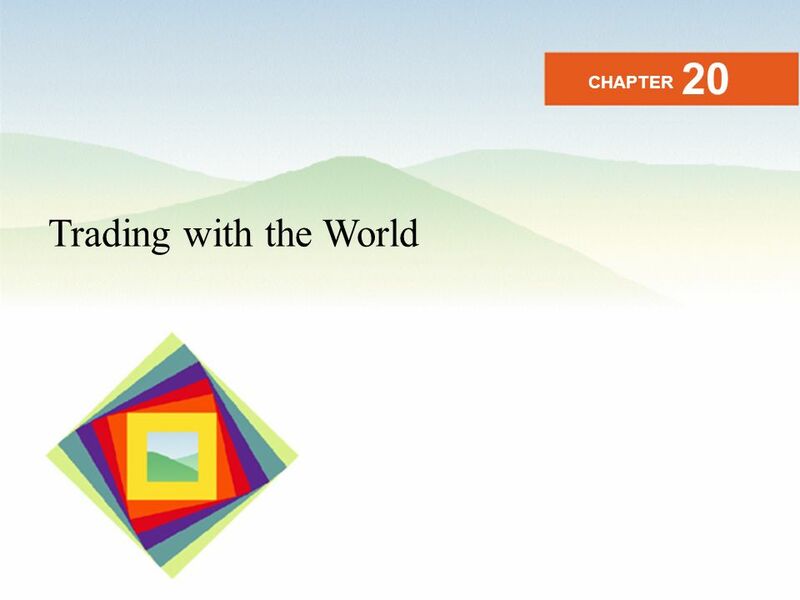 Copyright © 2006 Pearson Education Canada Trading with the World 32 CHAPTER. Ch.20: Trading with the World Trends in the Volume of Trade –In 1960, United States exported 3.5% of GDP imported 4.0% percent of GDP –In 2007, United.